Today I start with a heavy heart and condole the death of hundreds of people in Mozambique due to the devastation caused by cyclone IDAI. I condole the death of 50 persons who fell to the bullets of a terrorist in New Zealand. I condole the death of almost 100 persons due to the capsizing of a ferry in Tigris, Iraq. I condole the death of at least 47 people by the blast in a chemical factory in Yanchoug, China. The list seems to increase with every passing day. I have no words to adequately describe the pain and anguish in my heart. I can only pray for peace for the departed souls. In response to a request from the Republic of Mozambique that was hit by a tropical cyclone ‘IDAI’, causing loss of lives and severe damage to properties in Central and Northern part of Mozambique, India diverted three Naval Ships to the port city of Beira to provide immediate humanitarian assistance and disaster relief to the affected people. Indian Naval Ships provided relief material in the form of food, clothes and medicine. In addition, the ships took 3 medical practitioners and 5 nurses on board to provide immediate medical help. In that hour of tragedy, India stood ready to extend support to the affected people. Incidentally, India has been extending humanitarian assistance to Mozambique and had provided 10 million dollars for food grains in 2017, after it suffered food shortage as a result of natural calamities. The Asian Development Bank (ADB) and the Government of India signed a $926 million loan on 01 March, 2019 to operationalize two lines for the Mumbai Metro Rail System that would ease the distress of thousands of commuters each day and help provide a cleaner, less congested city. The single largest infrastructure project loan in ADB history will help fund the Mumbai Metropolitan Region Development Authority (MMRDA) to implement the project. Once operational by the end of 2022, an estimated 2 million passengers a day will use the two new lines, travelling in improved safety and comfort. It will reportedly also reduce emissions from vehicles, with carbon dioxide emissions expected to fall by about 166,000 tons a year. (India’s total external debt including the debt to ADB as on 30th September 2018 was US$ 510 billion). Incidentally, ADB retained India’s growth forecast unchanged at 7.3% for current fiscal and 7.6%for the next financial year. Friends, United States of America on 5th March 2019 gave a 60-day withdrawal notice to India on the Generalized System of Preferences (GSP) benefits extended by USA.Since the review initiated by USA in April 2018 on India's GSP benefits, India and USA have been discussing various trade issues of bilateral interest for a suitable resolution on mutually acceptable terms. GSP benefits are envisaged to be non-reciprocal and non-discriminatory benefits extended by developed countries to developing countries. In India's case the GSP concessions extended by the US amounted to duty reduction of only USD 190 million per annum. Due to various initiatives resulting in enhanced purchase of US goods like oil and natural gas and coal the US trade deficit with India has substantially reduced in calendar years 2017 and 2018. The reduction is estimated to be over USD 4 Billion in 2018, with further reduction expected in future years on account of factors like the growing demand for energy and civilian aircrafts in India. This reduction has happened in the face of a rising overall US trade deficit, including with some other major economies. India is also a thriving market for US services and e-commerce companies like Amazon, Uber, Google and Facebook with billions of dollars of revenue. The issue of Indian tariffs being high has been raised from time to time. It is pertinent that India’s tariffs are within its bound rates under WTO commitments, and are on the average well below these bound rates.On developmental considerations there may be a few tariff peaks, which is true for almost all economies. India was agreeable to a meaningful mutually acceptable package on the above lines to be agreed to at this time, while keeping remaining issues under discussion in the future. Union Minister of Commerce, Industry & Civil Aviation, Shri Suresh Prabhu inaugurated the 34th edition of Aahar 2019 at New Delhi on 12th March, 2019. This International Food & Hospitality Fair featured new trends in F&B as well as hospitality services, processing, culinary tech, retail and new innovations.The fair also featured a wide range of food products, machinery, F&B equipment, hospitality and Décor Solutions, Confectionary items from over 560 participants from India and abroad. The display profile was segregated into four categories namely, ‘Food Products, Ingredients & Additives’, ‘F & B Equipment’, ‘House Keeping & Engineering Equipment’ and ‘Confectionary’. The fair also offered an insight into the operational and food safety concerns and innovations to become energy-efficient, finding budget friendly raw materials for boosting productivity while still aiming for greater profitability. The ‘Culinary Art India’ and exclusive seminars on “Potential, Possibilities and Products to enable India Emerging as Leading Global Player in Organic Food Products” and “Role of Indian Corporate Sector in supporting enormous potential of MSME involved in Food Processing” were among added attractions for the participants and delegates. Foreign participations were from countries like China, Canada, Chile, Germany, Hong Kong, Italy, Japan, Malaysia, Netherland, Norway, Oman, Russia, Singapore, Spain, Turkey, Taiwan, USA, UK, UAE and Vietnam. Besides the general public, a significantly large number of Indian business people benefitted by visiting the fair. 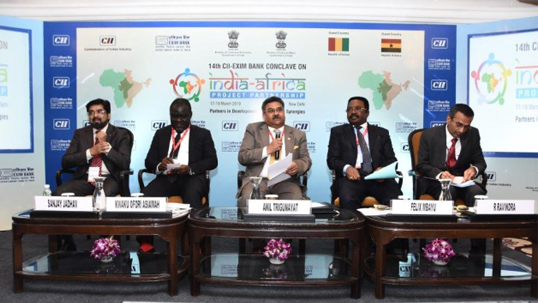 Ministry of Commerce & Industry organised the 14th CII-EXIM Bank Conclave on India-Africa Project Partnerships, in association with Confederation of Indian Industry and EXIM Bank of India in New Delhi from March 17-19, 2019. The event marked the deepening of India-Africa economic and business ties and paved the way for a whole range of cross-border project partnerships. The annual Conclave, since its inception in 2005, brings senior Ministers, policy makers, officials, business leaders, bankers, technologists, start-up entrepreneurs and other professionals from India and Africa on a common platform in a spirit of partnership. Dr. Mahamudu Bawumia, Vice President of Republic of Ghana, Dr. Ibrahima Kassory Fofana, Prime Minister of Republic of Guinea, Monyane Moleleki, Deputy Prime Minister of Kingdom of Lesotho were present in the conclave. Union Minister of Commerce & Industry and Civil Aviation, Shri Suresh Prabhu and Dr. Anup Wadhawan, Commerce Secretary also participated in the Conclave. More than 31 senior Ministers from 21 African countries apart from 600 business delegates from 40 countries participated at this event. The Conclave once again marked the pre-eminence of India-Africa partnership in the area of ‘South-South Cooperation’, at a time when the global economy is faced with intractable challenges that stem from rising protectionism and trade conflicts. The India-Africa bilateral partnership is augmented by India’s ascendency as the fastest growing major economy, as well as Africa’s new economic dynamism illustrated by some of the Sub-Saharan economies which are among the top 10 fastest growing economies in the world. The Conclave coheres into India’s broader vision of long-term engagement with Africa. I had the opportunity to ‘Chair’ the session on “West Africa – Exploring New Frontiers for Multi-Pronged Partnerships” on 19th March. The session discussed prospects of diversifying bilateral trade basket. It explored promising & attractive possibilities of Indian investments in West Africa. The session also discussed how best India could contribute to West Africa’s Regional Integration Initiatives especially in the area of regional infrastructure development and capacity building programmes. The speakers provided thought provoking valuable inputs. I also had the opportunity to be part of ICWA delegation to Riyadh where I shared my perspectives on India -Saudi economic potential and engagement in accordance with Crown Prince Salman's Vision 2030 and PM Modi's initiatives like ‘Make in India’ and ‘Digital India’ etc. You will recall that during his visit to India in Feb 2019, the Crown Prince had announced $100bn in potential investments in India. Hon’ble Vice President Shri Venkaiah Naidu went on a 2-country visit to the Central American region. This was the first high level visit from India to Paraguay and Costa Rica in almost 50 years of establishing diplomatic relations with these countries. Vice President started his engagements on Paraguay on 6th March by having meetings with the President and Vice President of the host country. This was followed by delegation level talks covering areas of mutual interests. He also had a fruitful discussion with the President of the Senate. The Paraguay leadership was deeply appreciative of India’s economic growth and technological strength as well as its large domestic market and India’s experience and expertise in a range of fields. As the discussions progressed, there was identification of new areas of collaboration, energy in particular renewable energy, health including traditional medicines, ICT, space, biotechnology, railways and tourism related infrastructure. As far as the economic relationship between the two countries is concerned, trade has been growing. It has grown from US$46.75 million in 2007-08 to US$335.33 million in 2017-18. This healthy growth rate is welcome but there was recognition on both sides that we need to diversify and expand our trade basket. In that context Hon’ble Vice President spoke of India meeting Paraguay’s needs in intermediate engineering goods, in pharma products and agriculture machinery & equipment. There was also discussion on how to work through Mercosur, the regional grouping in Latin America. India has a preferential trade agreement with Mercosur. Costa Rica is the leading economy in the Central American region. Vice President Shri Venkaiah Naidu visited Costa Rica on 7th & 8th March 2019. Besides having a meeting with the President of Costa Rica followed by delegation level talks, the Vice President addressed the India-Costa Rica Business Forum as well. Amongst the areas for cooperation specifically were mentioned the pharmaceutical sector including biotechnology, health sector, renewable energy including hydel power, IT, digital economy, tourism particularly eco-tourism and transportation. These were discussed in details. India has already made available $30 million line of credit to Costa Rica per year and it was agreed that in some of these areas we could look at the possibility of India undertaking a project preparation facility to help their pre-feasibility studies for projects which could be undertaken through this line of credit. Your Chamber MIICCIA was associated with the Royal Thai Embassy in New Delhi and organized a Buyer-Seller Meet (BSM) at the Select City Mall, Saket, New Delhi on Saturday, 16th March, 2019. 27 MSME enterprises from Thailand participated in the BSM and showcased their products. MIICCIA could organize participation of a significant number of Indian business houses in the BSM to explore reliable and long lasting partnerships. Products of MSME constitute a significant component of total bilateral trade between India and Thailand which was almost US$ 10.12 billion in 2017-18. The Ambassador of Thailand in his inaugural speech acknowledged the contributions made by MIICCIA for the successful organisation of the B2B meetings. Your Chamber was also associated with the partner Chamber, Asian-African Chamber of Commerce& Industry for organizing the ‘Asian-African Leadership Forum 2019’ on 23rd March 2019 at Hotel The Grand, Vasant Kunj, New Delhi. This was an award recognition programme, recognizing and honoring business leaders from across continentswho have shown outstanding performance in developing successful businesses. Embassies of Korea, South Africa, Nigeria, Malawi and Zimbabwe in India were represented in the Event. Friends, election for formation of the 17th Lok Sabha and 4 States have been announced. The Prime Minister in a tweet has described the election as “festival of democracy”. It is the world’s largest democratic exercise involving around 900 million voters. The total population of the European Union as on 1.1.2018 was 513 million whereas the same for USA on the same date was 328 million. What a mammoth exercise is our election process! India is changing, and changing fast. The aspirational young Indians are increasingly restless for a faster growth. Let us all take part in this democratic process and elect our own government by exercising our rights. Democracy must prevail and must be strengthened. The election gives us an opportunity to strengthen our dedication towards building a New India that our freedom fighters would be proud of. Let us all take part in this “festival”. I wish all of you success, prosperity and happiness. As we all know, 40 CRPF personnel were killed in a suicide attack by Pakistan-based Jaish-e-Mohammed (JeM) in Jammu and Kashmir's Pulwama district on February 14, sparking overwhelming outrage in the country. We unequivocally condemn this dastardly act resulting in loss of so many innocent lives.We pay homage to our brave soldiers and express our solidarity with the bereaved families. India gave a fitting response by decimating the proscribed terrorist group JeM’s training and recruiting camps at Balakot through aerial strikes without any collateral damage to civilian or military installations in Pakistan. The Budget has been acclaimed as good and progressive in the business circles. Sensex which opened at 36,099.62 on Jan 28, remained almost at the same level 36,025.72 on Feb 28. Friends, your chamber, The Millennial India International Chamber of Commerce, Industry & Agriculture (MIICCIA) hosted a Business Conference : “India-ASEAN : Connecting for Business” at New Delhi on 18th February 2018. The conference deliberated to collectively identify suitable economic opportunities in ASEAN countries and to create reliable networks for the Indian business and industry in a unique format where the Ambassadors/High Commissioners of all the 10 ASEAN countries shared the perspectives and business opportunities available in their respective countries. Senior Government officials spoke on available economic opportunities in India and the way forward. The presentation by Shri Sundeep Kumar Nayak, IAS, Managing Director of NCDC and Chairman of NEDAC regarding “Cooperatives to Cooperatives Trade – An Effort to Maximize Income of Farmers” was thought provoking. As the full form of MIICCIA (Millennial India International Chamber of Commerce, Industry & Agriculture) suggests, and unlike other Chambers, your Chamber is committed to the development of Agriculture, in addition to Commerce and Industry. The participants learned about NCDC/NEDAC’s initiative for hosting the 1st India International Cooperatives Trade Fair in October 2019. MIICCIA will promote the Fair through its resources in India and abroad. Friends, may I inform you that your Chamber (MIICCIA) will also organize interactions with Heads of Missions from India and Africa; India and Arab countries and India and the CIS countries in near future. The Chamber has in the past hosted B2B meetings for large business delegations from Argentina, Guatemala, Russia, Latin America and Brazil. It has ambitious projects of mounting many trade & investment delegations to different countries. The first of such outgoing business delegation is planned in Sept-Oct, 2019 for Jordan, Syria and Iraq which have promising opportunities. Later a delegation and BSM are being planned for China and some ASEAN countries. Friends, India has marched forward to become the fastest growing economy in the world. ‘Incredible India’ no longer remains only a national imagination, and that makes MIICCIA a more responsible Chamber of Commerce in the country. One of our partner chamber, the Asian-African Chamber Commerce & Industry (http://aalf.asianafrican.org) , in association of the Millennial India International Chamber of Commerce, Industry & Agriculture (www.miiccia.com) will host the Asian-African Leadership Forum 2019 on 23rd March 2019 at Hotel The Grand, New Delhi. This is an award recognition program, recognizing and honoring business leaders who have shown outstanding performance in developing successful businesses. The organizers expect that more than 200 entrepreneurs and professionals from varied industries representing Asia and Africa will participate in this event. We will be happy to see you at the event. For further details, you may contact Ms. Deepa Sharma at AACCI on her mobile No. 8511213632. I wish all of you success in your lives and economic ventures. In the latest World Bank’s Doing Business 2019 Report, India once again made significant strides; a jump of 23 places to reach Rank 77 out of 190 economies. This jump is even more significant given India’s 30 place jump last year, which brought it to Rank 100. This is a rare feat for any country. India is now the best ranked from the South Asian region.WB once again recognized India as one of the top 10 improvers in this year’s assessment, for the second year in a row. India has improved by 53 positions in the last two years, and 65 positions in the last four years. India is first South Asian and BRICS nation to have achieved this. India improved its rank in 6 of the 10 indicators measured by WB. The 2 most significant improvements were those in the indicators for Construction Permits (jump of 129 spots to rank 52), and for Trading Across Borders (jump of 80 spots to rank 66). The indicators where India gained ground are Starting a Business, Getting Credit, Getting Electricity and Enforcing Contracts. India streamlined the process of obtaining a building permit and made it faster and less expensive to obtain a construction permit, and reduced the time and cost to export and import through various initiatives, including implementation of electronic sealing of containers, upgrading of port infrastructure and allowing electronic submission of supporting documents with digital signatures. The continued relentless drive by the Government to push hard regulations and reforms in order to improve the business climate is validated by India’s consistent improvement over the last few years. India’s Distance to Frontier (DTF) score, a measure to assess how close a country is to global best practices, has been improving consistently since the last few years. The 9th edition of global summit ‘Vibrant Gujarat’ (a concept that started in 2003) was held in Gandhinagar on 18th& 19th January, 2019 with 15 Partner Countries and 135 Participating Countries. 5 Heads of State including the President of Uzbekistan and Prime Ministers of Denmark, Czech Republic, Malta and Muscat were present at the event. In what is a testament to its global reach and influence that Vibrant Gujarat Summits have earned over the years, more than 39 international Chambers of Trade & Commerce from 27 countries worldwide participated in a special conference organized at the sidelines of the Summit. During the Summit, 28,360 MoUs were signed, of which 21,289 were in MSME, 1,1516 were in Urban Development, 548 in Power, Oil, Gas & Renewable Energy, 408 in Agro & Food Processing, 313 in Environment & Forests, 197 in Engineering and 977 in other sectors. The Chief Minister of Gujarat in his address expressed confidence that VGS 2019 would generate additional 21,00,000 job opportunities in the State. Speaking at the Summit, our Vice-President said “India is poised to become US$ 10 trillion economy by 2030”. In his inaugural address, the Prime Minister invited global business leaders to come and invest in India where the business climate is more investor friendly now. He said “India is now ready for business. In the last 4 years, we have jumped 65 places of global ranking of ease of doing business”. The 2nd edition of the Tamil Nadu Global Investors Meet 2019 was held on 23rd and 24th January 2019 at the Chennai Trade Centre. Besides a host of Indian companies, Australia, France, Japan, South Korea, Singapore and United Kingdom participated as Partner Countries. Terming the Meet (GIM) a “grand success” and announcing the state’s prioritized effort to launch electric car manufacturing facilities, the TN Chief Minister said the event exceeded the investment target of Rs 2 lakh crore and touched Rs 3.4 lakh crore. The CM added that the fresh investment would create additional 10.5 lakh jobs. Altogether, 146 MoUs regarding investment commitments from Japan, South Korea, Taiwan, Germany, France, Finland, USA and China were signed at the Meet. Friends, the Pravasi Bharatiya Divas this year was organized on 21 to 23 January 2019 at the holy city Varanasi. As per tradition it was inaugurated by the Prime Minister on 21st and concluded by the address of the President on 23 January 2019. Exceeding expectations, there were 7,228 registrations at the function. Besides the country specific sessions, there were 2 plenary sessions; the first one was on “Role of Indian Diaspora in capacity building for affordable solar power” and the second one was on “Giving back to India : Opportunities and Challenges”. H.E Mr. Pravind Jugnauth, Hon’ble Prime Minister of Mauritius and Hon’ble Shri Narendra Modi, Prime Minister of India were the Chief Guests. At the invitation of the Prime Minister of India, His Excellency Cyril Ramaphosa, President of South Africa undertook a State Visit to India on 25-26 January 2019 as the State Guest of Honour for Republic Day 2019. A high level delegation consisting of nine Ministers, senior officials of the Government and a 50-member business delegation accompanied the President. President Ramaphosa along with Prime Minister Modi addressed the India-South Africa Business Forum on 25 January, 2019, with the objective to grow business ties between the two countries. The President also delivered the Gandhi-Mandela Freedom Lecture organized by Indian Council of World Affairs under IBSA framework as a part of the celebrations of the 15th Anniversary of IBSA. About 1.5 million Indian Origin People live in South Africa and form an enduring link. Over 150 Indian companies have invested in South Africa employing over 20,000 locals. India is among the top five trading partners of South Africa. The bilateral trade has increased to US $ 10.65 billion in 2018-19 from US $ 9.38 billion in 2017-18. Both countries have close cooperation in the areas of vocational training, capacity building etc. 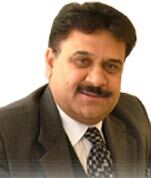 The visit is expected to further strengthen and enhance the close relationship between India and South Africa. MIICCIA organized B2B meetings at the Imperial Hotel, New Delhi on February 6, 2019, between prominent Indian IT Companies and a visiting IT Delegation from Brazil. Participants had fruitful discussions. In the end, I should remind you all that your Chamber of Commerce (MIICCIA) will host the Business Conference “India-ASEAN : Connecting for Business” on Monday, February 18, 2019 at the Civil Services Officers’ Institute, Vinay Marg, New Delhi. Shri Suresh Prabhu, Hon’ble Minister of Commerce, Industry & Civil Aviation has tentatively agreed to address the Event. Senior Officials from the Ministry of External Affairs and the Heads of Mission and the Economic Counsellors of ASEAN countries will detail the business potential in their respective countries. I would urge all of you to be present at this Business Conference and benefit from the deliberations and networking opportunities. I extend my good wishes to all of you. I extend my Greetings on the New Year 2019. I wish great success to our Members, the Indian Industry, Business Houses and Investors. The New Year seems to be an encouraging one for the Indian Industry, Business and Exporting community. Economic indicators are healthy. Growth of GDP for the first half of 2018-19 was 7.6%. Current account deficit as percentage of GDP was 2.7% in the same period. Value of merchandise exports and imports increased by 11.6% and 14.7% respectively in US Dollar terms during April-November 2018.Foreign Exchange Reserves stood at US$ 393.7 billion at end November 2018. CPI inflation declined to 2.3% in November 2018 from 3.4% in the preceding month. WPI inflation was 4.6% in November 2018, as compared to 5.3% in October 2018. The growth of Index of Industrial Production (IIP) during April-October 2018 was 5.6%, as compared to 2.5% recorded during corresponding period a year ago.Though there was a slight negative growth (0.87%) in export of Services, trade balance in Services was US$ 6.57 billion in end November 2018. Therefore, the New Year starts with a positive note. The Government launched a historic support and outreach programme for the Micro, Small and Medium Enterprises (MSME) sector in November 2018. As part of this programme, the government unveiled 12 key initiatives which would help the growth expansion and facilitation of MSMEs across the country. At the inaugural session of the 15th Global SME Business Summit in New Delhi, Minister of Commerce & Industry and Civil Aviation, Shri Suresh Prabhu, said that the Ministry was examining the proposal to set up trade promotion bodies in 15 countries to promote exports of SMEs from India. MOU with Asian - African Chamber of on 03rd January 2019. In the context of India’s ‘Act East’ policy and Prime Minister’s thrust for deeper engagement with ASEAN countries, MIICCIA is organizing a Business Conference “India-ASEAN Connecting for Business” on February 18, 2019 at the Civil Services Officers’ Institute (CSOI), Vinay Marg, Chanakyapuri, New Delhi. The conference will try to identify suitable economic opportunities in ASEAN countries, and create reliable networks for further boost to trade & investment. The Conference will benefit Indian entrepreneurs and business houses with updated information and also provide a platform to interact with Heads of Mission of the ASEAN countries. MIICCIA’s Secretariat would be happy to provide additional information and participation procedure. We are all waiting for the Interim Budget of the Central Government on 1st Feb. In a bold decision and departure from the past practice, the Government has decided not to present the Economic Survey before the interim budget. They have left the Economic Survey, which outlines the vision and the economic road map for the upcoming year, for presentation by the new government before the full budget. I once again wish all our Members and Associates a great year of success in 2019.